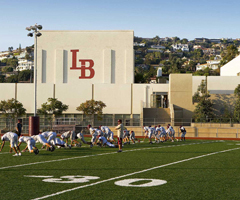 Students interested in participating in athletics at LBHS will need to complete an online athletic clearance to participate. To complete the online process, the LBUSD Physical Examination Form must be completed, signed by a doctor, and then uploaded the clearance website. If you are unable to print a copy, forms may also be picked up in the athletic office. As a part of this process, a current medical insurance card must also be uploaded. If you do not have insurance, sport-specific insurance can be purchased through the athletic office. Your athletic physical is good for one calendar year and must be done prior to trying out for another sport. When you have completed the clearance process, you will print a confirmation letter to return to the athletic office. Please feel free to use our Athletic Clearance Cheat Sheet or contact Tracy Paddock, athletic assistant, with any questions.